Young attendees at this year’s Knost Music Workshop appear to perhaps be performing a musical number complete with hand gestures. Portsmouth native and Oberlin College student Matt Bickett performs on the Cornerstone Church organ while church music director and Knost volunteer instructor Becky Climer chats with the unseen audience. Knost volunteer instructor Molly McCain teachs the finer points of playing the boomwhacker to a group of young students. All this week, at a clip of about 170 per day, youth from around Portsmouth and, in at least one case, well beyond, have been learning all about classical music and instruments, ranging from piano and organ to hand chimes, violins and, of course, the storied boomwhacker. 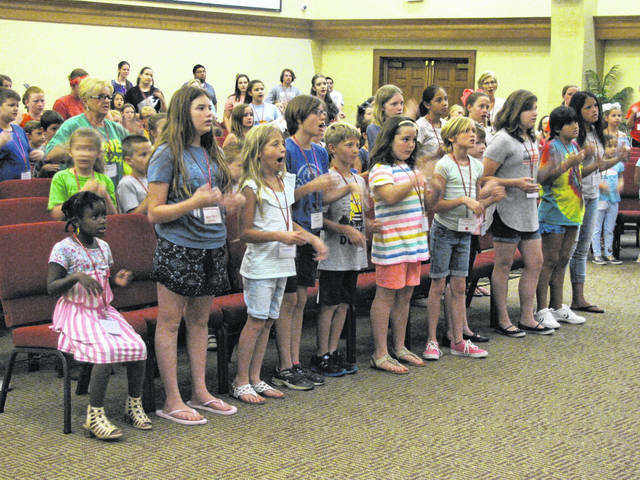 This year marks the 45th annual Dorothy Knost Children’s Summer Music Workshop, held this year as it has been annually since the early 1990s, at Cornerstone United Methodist Church. Cornerstone music director Becky Climer said early versions of the Knost workshops began in 1973 and mostly were aimed at students of the very well-known local piano teacher. The workshop last year offered 14 classes in things ranging from piano to guitar and voice. Each child chose two classes to take throughout the week. “It’s just amazingly popular,” Climer said regarding the workshops. She talked about one student, apparently the grandchild of a local, who was visiting Portsmouth from Wisconsin. Returning to the history of the workshops, as their popularity grew, Climer said Knost began to open the sessions to children other than her students. She had only two rules, which despite the growth of the workshops, remain in effect today. The first rule is no child ever pays for a workshop. The second rule is instructors are not paid but must work as volunteers. Climer said organizers do pay performers to visit the workshops, such as Portsmouth native Matt Bickett, who played and discussed Cornerstone’s church organ for his young audience. Now a musical performance (and theology) student at Oberlin College, Bickett once sat in the audience of a Knost workshop himself. A winner of prestigious national organ competitions, who has won scholarships to study organ and music in Europe this summer, Bickett has credited the Knost workshops with helping to inspire what has become his lifelong devotion to music. Not only do the children get to try out the instruments and singing for themselves, they also are introduced to attending music performances. Ramblers, who perform Celtic and folk music; the Portsmouth Ringers, a hand bell choir; and, artists from the Portsmouth Area Arts Council Children’s Theater, who performed outtakes from recent shows. The Knost workshop runs through today and culminates in a 6:30 p.m. performance at Cornerstone by workshop students. While it is intended mostly for parents, the event is open to the public. Somewhat incidentally, if you’re wondering about those boomwhackers referred to earlier, Climer said they are very similar to PCV pipe, but thinner and, believe it or not, they can be tuned based on the thickness and length of the individual pipes. Children “play” boomwhackers by banging them on the floor. The man who invented them came up with the idea after watching his children play with cardboard tubes, such as from wrapping paper, according to Climer. “The guy’s a millionaire, seriously,” said Cornerstone’s musical director. https://www.portsmouth-dailytimes.com/wp-content/uploads/sites/28/2018/06/web1_kddie-crowd-shot-better-2.jpgYoung attendees at this year’s Knost Music Workshop appear to perhaps be performing a musical number complete with hand gestures. 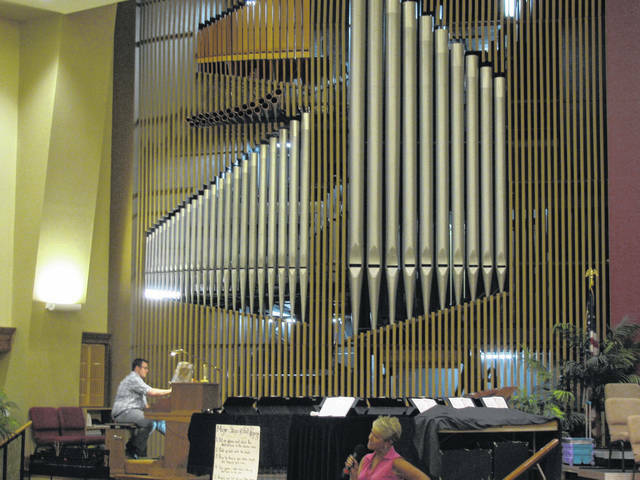 https://www.portsmouth-dailytimes.com/wp-content/uploads/sites/28/2018/06/web1_matt-on-organ-a.jpgPortsmouth native and Oberlin College student Matt Bickett performs on the Cornerstone Church organ while church music director and Knost volunteer instructor Becky Climer chats with the unseen audience. 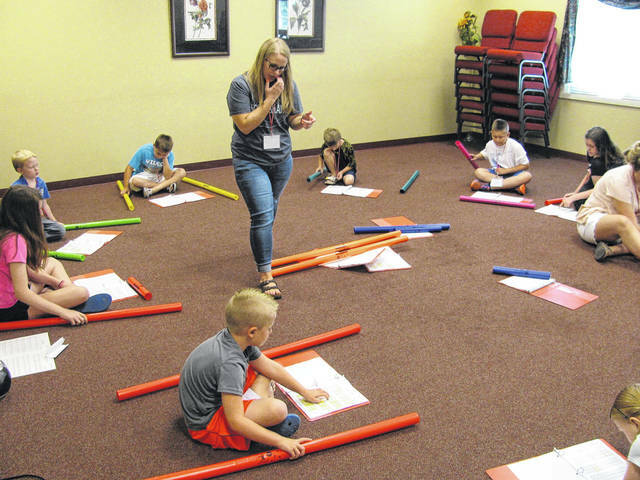 https://www.portsmouth-dailytimes.com/wp-content/uploads/sites/28/2018/06/web1_Molly-McCain-2.jpgKnost volunteer instructor Molly McCain teachs the finer points of playing the boomwhacker to a group of young students.